After conversations with friends from the UK, we only felt it would be right to do a show in conjunction with Drift Allstars. 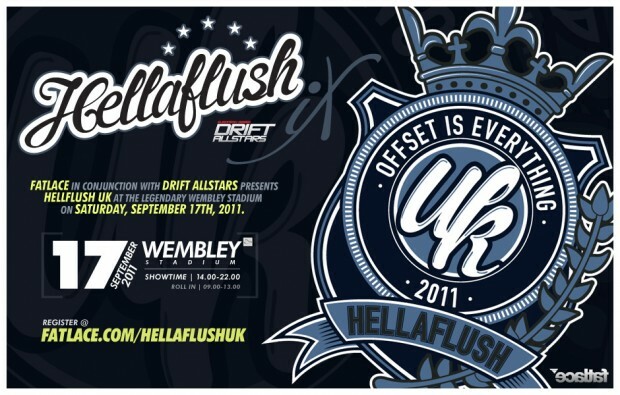 Fatlace & Drift Allstars are proud to announce Hellaflush UK at Wembley Stadium, September 17th, 2011 for the Finals of Drift Allstars. Yes, this September. We’re welcoming cars of all makes and models to join us at this event that represent the Hellaflush Lifestyle! Register now as space will be limited to 200 cars! HellaFlush is a car culture born in California, USA in 2003. Fitment concious, slammed car and sleek outlook on life have for several years now commanded the trend in modified cars. As the pioneers of the culture, Fatlace bring HellaFlush to Europe where a style deeply rooted in Europe and engrained in the scene can gather. We are still looking for media partners and supporting sponsors/partners for HellaFlush UK show.If you are interested in partnering with the HellaFlush UK showcase offering prizes. Gutted! I was looking forward to this, is it likely to be rearranged for another date? will there be another date? Yes, we are planning something else. Details soon. Trust us, we’re very dissappointed. Wish this was happening, but I completely understand! Oh man, literally can’t even begin to express how many people are upset right now haha. I must not be the only elsewhere, I and my French friends have reserved hotel and Eurotunnel, so we set a budget for this gathering hellaflush whose reputation is more to do. I find it kinda sad excuse of details and preparation. You have scheduled a backup solution for people who still will be present at this time. I saw that you postpone the event in September. I am not, unfortunately, not yours. How is it possible to cancel everything with equal participation of several countries knowing that you announce the event long ago! Many French waiting for this appointment you must. The Stanceworks members are looking into putting on a huge meet this day instead now. We know a lot of people have taken the time off work, myself being one of them. We will try keep it around the same area, full details to be released this week. Please keep us informed and how we can help. We’re still figuring something out as well. Maybe we team up with the stanceworks guys from the uk and do something. Makes sense. Thank you Mr. Mark Arcenal. We had several participants have already reserved the weekend of July 24, 2011. We will be what happens. I hope that the guys Stanceworks you can organize a nice day. Assistance can be placed cars, manage the entry, translate french. Let us help you create and set up an event has the reputation of hellaflush or stanceworks and Fatlace. If you want we can predict the future for this kind of event in France for a meet HELLAFLUSH FR ? In any case, I and many participants are eager that you save the day. If you’d like to help us, please hit us up slammedsociety@gmail.com and we’ll make sure to have a great day. Gutted! was looking forward to this more than any other show this year.